Bumblee the leader of autobots is back, and this time, he is fiercer and can quickly transform from the mighty robot to a semi-truck mode when battle calls. Transformers Robots in disguise mega Optimus prime action figure is a character in the Transformers animated series where Bumblee is leading a new team of robots to detain the Decepticons loose on the Earth. The objective is to capture them in their robots in disguise form. 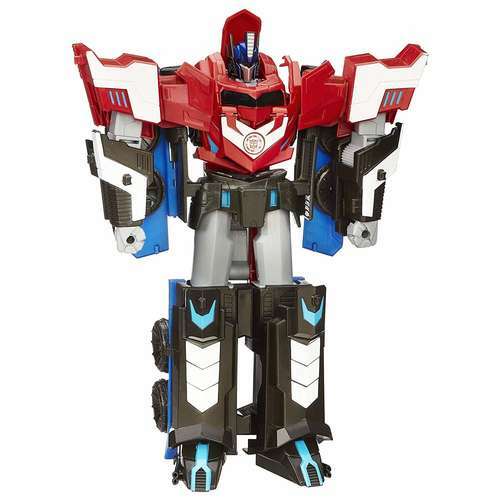 Also, the Transformers robots in disguise mega Optimus prime action figure can be connected to mini-con figures to form armour and other weapons for big battles. The mini-cons can either travel in pairs or team up with the leader who becomes their master. They are attached to special connection points of the mighty bot's figures, e.g., the legs and the arms ready when rolling out for battle. The mini-con figures also convert from bots to weapons and back easily. Users can also activate the Mega Optimus Prime Character in the robot using the Disguise app by scrolling the figure's badge. The Robots in Disguise app provides an interactive mobile gaming experience that brings the characters to life. You can use a compatible mobile device to download the app, browse the unique shield feature on the robot to activate the Optimus Prime mode and the weapon on the transformer. Use a Playmobil Family Fun Aquarium Enclosure 9063 to enjoy the all the action as this fast-changing Mega Optimus figure fights the Decepticons in sight.